When first planted, a young seedling is usually no bigger than the surrounding ground cover or weeds, weeds grow more quickly than your new seedling so they can overrun it, robbing your plant of much-needing nutrition and moisture. 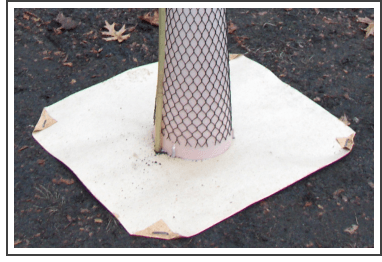 Weed mats are a made from two sheets fiberglass reinforced craft paper with a semi-permeable medium between them. The mats are "36x36" with an X-cut in the center. When planting your seedling you first scarify (i.e. "scrape off") the soil surface removing any weeds or other ground cover immediately surrounding the planting. After planting the seedling in the ground, "fish" the seedling through the X-cut in the mat as you lay it flat around the planting. Tack the corner of the mat to the ground by folding back the corner like a "dog ear"; 2 or 3" back and push a landscape staple through the corner to hold it down. Some users simply kick a little soil over the corners or lay field stones over them to keep them down. The weed mat will stifle competing vegetation from getting started next to your planting. The mats are semi-permeable, so they will still allow moisture through to the ground but will slow down evaporation and wind desiccation from the soil immediately surrounding your planting, directly benefiting it. The mats will decay quickly 4-6 months and are usually completely decomposed and disappear by 12 months. Call us for additional information on ordering weed mats and landscape staples.